Of all the "two kinds of people" in the world, I seem to be among the group that craves a certain amount of disorder. This has been much to my mother's dismay. She equates order and balance with beauty and good. Manicured and perfectly landscaped environments make her happy and make me itch. Too much landscaping can lead me to despair. When I start seeing weeds growing up through cracked pavement, corn growing in the parkways, and street chickens I begin to breath easier, to relax. It feels like I belong there, like humans belong there. Beautiful and imaginative graffiti in Silver Lake, painted over by the City. So even though there was a general hue and cry over graffiti in the Monument, and rightly so, good, old-fashioned graffiti on seemingly abandoned buildings brings me great joy and optimism. I'm not very good at explaining why. I'll have to think on it, but I believe it has to do with truly free speech. If you have the chance, watch the documentary Vigilante Vigilante: The Battle for Expression. The documentary makes a case for graffiti, and most law-and-order types will grudgingly admit to beauty in some of it - that some of it is art. But Vigilante Vigilante lobbies for taggers and defends tagging, and though I can't exactly remember why, my own take has been that there really are no public venues for youth to express themselves. All over they see the tags of corporations, city government, and private land holders marking the environment they live in. 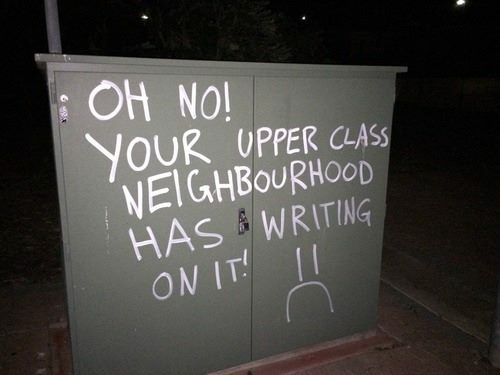 Tagging is a way of saying, "Hey, I live here, too." Instead of acknowledging that the city has failed our youth, city officials equate tagging with gangs and murders and put the youths that they catch in the murky dungeon of the State of California's Gang Database. Maybe one of the most beautiful things about graffiti is that it's not allowed. If by observing something we change it, governmental and corporate approval generally seems to change things for the worse. The change is never unnoticed. 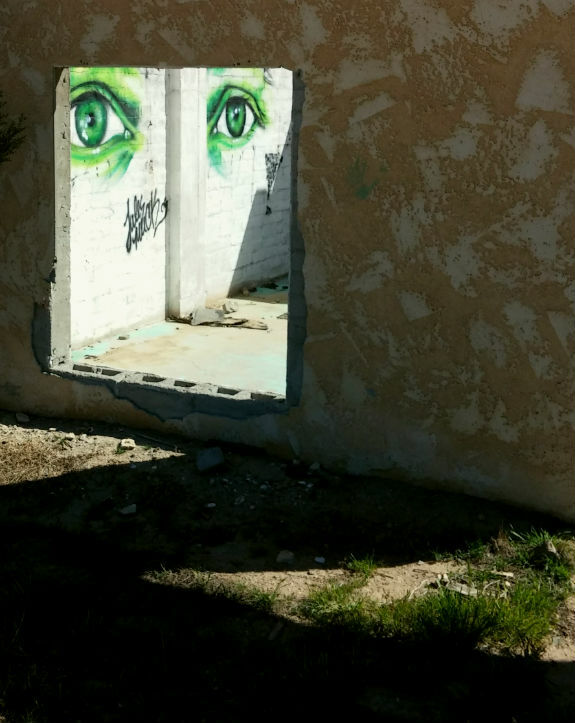 Cathy Allen, an art instructor at the Copper Mountain College, today posted about new murals that popped up in Wonder Valley. After conferring with a friend wise to the works of graffiti artists I located a video of the process and the finished work. The artists are Mear One, Cyrcle and Vyle One. This is lovely work and so fitting in its environment. In a landscape where the hand of man has left destruction these artists brought unexpected beauty. Mear One, aka Kalen Ockerman, responded to Andre Saraiva's tagging a rock in the Joshua Tree National Park in an article in the LA Times. "Graffiti art is the honest voice of the dissatisfied soul — it's a political act," Ockerman said. Then he added, "All Andre did was smear a work of art by mother nature with industrial chemicals to celebrate his own ego." The work above reminded me of another piece I'd seen in Joshua Tree last spring, and I researched the artist who painted it. This is across from the VFW in Joshua Tree and is the work of artist Jules Muck. How sweet it was to turn and be greeted by eyes as bright as the small tufts of grass that briefly sprouted up this spring! It's additionally fresh that the artist is a woman. These are the kinds of disorder that salve the soul that must face the probable eventuality of yet another Dollar General in the Morongo Basin, in the anti-corporate Joshua Tree no less, wage-slaving our population, literally poisoning our youth with lead gew gaws from China, and grudgingly selling milk and eggs so it can take all it probably wanted in the first place: SNAP money. And yet, that building will be the epitome of order. Trees and bushes will be neat and trimmed and weeds and bugs will be poisoned out of existence. Here's a video antidote to my rant. If I've been a downer today, dear reader, please forgive me. Enjoy the beauty of the human spirit, which continues to pop up in the desert like shaggy mushrooms in a wasteland of corporate order. Thanks, Sara! Come to the movies on Saturday. Bring your child - stay as long as you want or can, and don't forget breakfast on August 1!